Prominent & Leading Manufacturer from Jaipur, we offer marble rangoli. With clear intentions to spread our business all across the globe, we are affianced in providing a comprehensive array of Marble Rangoli in plethora of designs and attractive shades. The rangoli offered by us is precisely cut, finished and polished by our highly experienced professionals under the visionary guidance of our ingenious professionals. This rangoli reflects a typical Indian style and much applauded by the patrons for interior home furnishing applications. 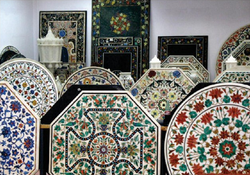 Also, the offered rangoli is offered industry leading prices for to our esteemed clients.